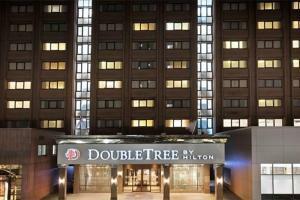 The DoubleTree by Hilton Glasgow Central features a prime location in the city center, within walking distance of Glasgow's shopping district and the iconic Glasgow Cathedral. 300 stylish rooms and suites offer Wi-Fi, 40" flat-screen TVs and round-the-clock room service. De-stress with a workout or a swim in the Juvenate Health and Leisure Club, or take it easy with a drink at the Cask Bar. Enjoy a meal at Brisket, serving fine beef from the Buccleuch estate. Popular attractions such as SSE Hydro, Style Mile shopping district, and Hampden Stadium are just a short walk away. Located 10 minutes away from Glasgow Queen Street and Glasgow Central railway stations, and a 14 minute drive from Glasgow International Airport. George Square, Glasgow Cathedral, Glasgow Green, SSE Hydro, Kelvingrove Art Gallery and Museum are all less than two miles from the hotel.